HERE’S good news to fans and supporters of chess superstar GM Wesley So (who just completed his freshman year at Webster University). So was honored by Filipino-Canadian Sen. Tobias C. Enverga, Jr. of Ontario, Canada for bringing honors to the Philippines with his gold-medal winning performance in the recent 27th Summer Universiade in Kazan, Russia. The 19-year-old Filipino champion, who made history by becoming the country’s first-ever gold medalist in the Universiade while representing the Federation of School Sports Association of the Philippines (FESSAP), was presented with a certificate of recognition by Sen. Enverga during a courtesy call in Ontario. So, on the other hand, showed Sen. Enverga his Kazan Universiade gold and shared some photos of his successful campaign in the prestigious competition billed as the ‘Olympics’ of university athletes. The two also played chess during the visit. Sen. Enverga is the first Filipino-Canadian elected in the City of Toronto and serves as trustee to the Toronto Catholic District School Board. He is co-chair of the Asian Heritage Month Celebration for the Greater Toronto Area and was previously a director of the Canadian Multicultural Council- Asians in Ontario. He is also the founder of the Philippine Canadian Charitable Foundation and a former president of the Philippine Independence Day Council. A graduate of Bachelor of Arts in Economics at the Letran College-Manila, Enverga was the recipient of the Queen’s 60th Diamond Jubilee medal of distinction in 2012. FESSAP president David Ong congratulated So for his newest honor, saying the recognition given by the Filipino-Canadian senator is also an honor to the country. “FESSAP is very happy to be a part of So’s historic gold medal in the Kazan Universiade. It’s really a once-in-a lifetime achievement and a big honor for the Filipino people,” said Ong after being informed of So’s award of recognition from Ontario, Canada. Ong said Sen. Antotio Trillanes IV has also prepared a Senate resolution commending So for his success in the Kazan Universiade. He noted that Sen. Trillanes also sponsored a Senate resolution when taekwondo star Samuel Thomas Morrison of Far Eastern University bagged the silver medal during the 26th Summer Universiade in Shenzhen, China in 2011. In Kazan, So defeated former world junior champion GM Zaven Andriasian of Armenia in their Armageddon game to capture the coveted gold medal. 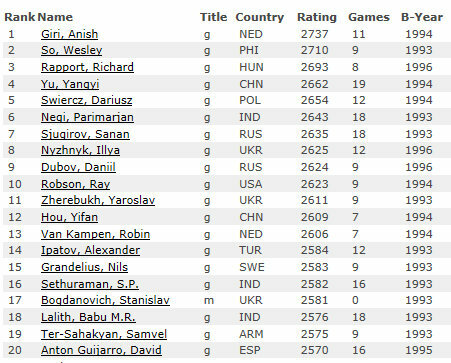 So and Andriasian finished in a nine-way tie for first place after the nine-round competition and ended tied again after three tiebreakers, forcing tournament director Aleksandr Tkachiev to order the one-game playoff where white had five minutes and black had four minutes. The Armenian won the toss coin and chose to play white. The Filipino, however, clinched the win in a threat of a mate after 51 moves. And for the first time, the Philippine flag was raised high in the Universiade ahead of the flags of Armenia and China while So and the rest of the participants stood in attention. It was also So’s first-ever gold medal in the Universiade, also known s the World University Games. Meanwhile, Balitang Canada will feature So and his successful performance in the Kazan Universiade in TFC this weekend, according to So’s mom Leny. Select photos of So during the two-week long competition will also be shown. 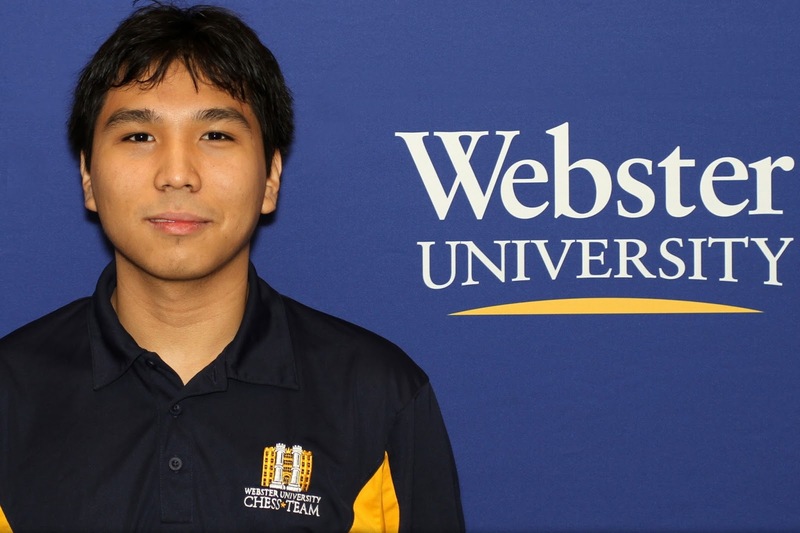 GM Manuel Leon Hoyos, who just completed his freshman year at Webster University, has captured the US Open g/15 Championship title in Wisconsin. He scored 4.5 / 5 to win the event clear first. Manuel also won the overall US Open Championship last year. He will attempt to defend his title this year. The 21st Annual Southern Open was held on July 26-28, 2013, at the Wyndham Orlando Resort, 8001 International Drive, Orlando, Florida. 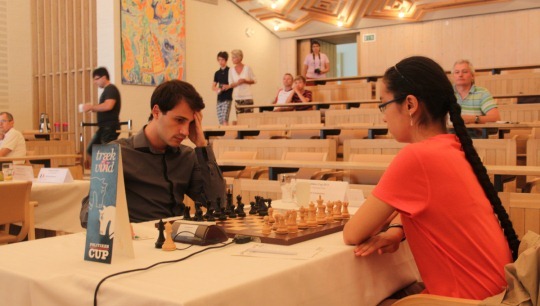 The event was held in five sections (Open, U2100, U1800, U1500, U1200) and the playing format was 5-round Swiss. 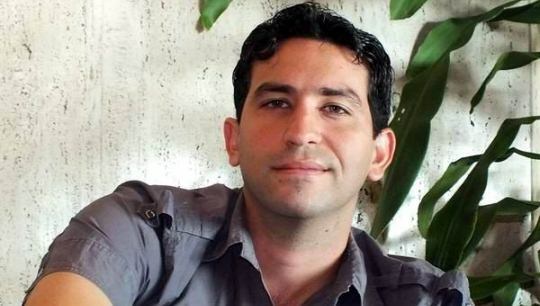 Cuban Grandmaster Yuniesky Quesada Perez took a clear first place in the Open Section with 4,5 points to win the top prize of 2000 USD. 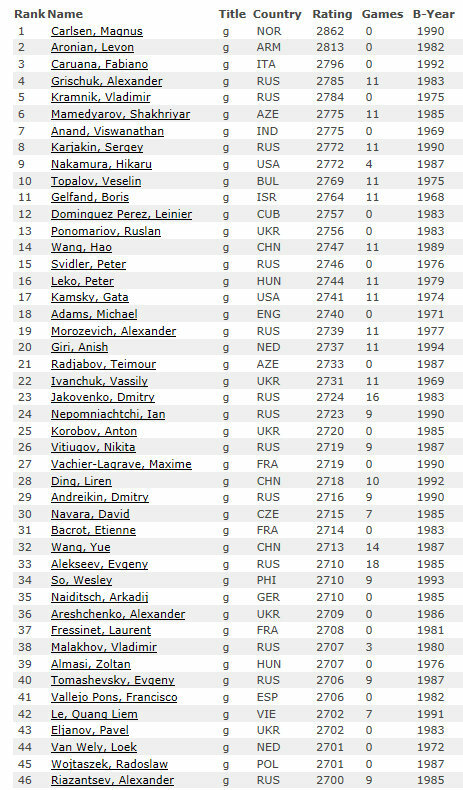 Florida resident GM Lars Bo Hansen is second with 4,0 points. Open Section: $2000-1000-500-300, clear/tiebreak winner $100 bonus, top Under 2300/Unr $800-400. FIDE rated. Under 2100 Section: $1400-700-400-200, top Under 1900 (no unr) $500. Under 1800 Section: $1400-700-400-200, top Under 1600 (no unr) $500, no unrated may win over $500. Under 1500 Section: $1200-600-300-200, top Under 1300 (no unr) $400, no unrated may win over $300. Under 1200 Section: $600-300-200-100, trophies to top Under 1000, Under 800, Unrated. No unrated may win over $150. 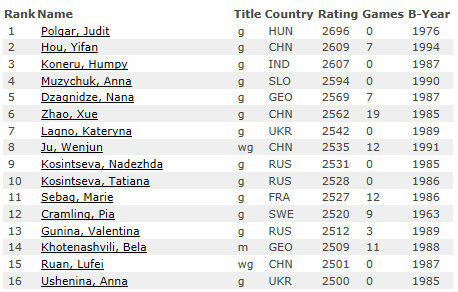 Bulgarian Grandmaster Ivan Cheparinov leads Politiken Cup 2013 with perfect score after the first 6 rounds. Today he defeated Hrant Melkumyan to maintain half a point margin ahead of Parimarjan Negi and Sergey Erenburg. In the 7th round Cheparinov will play against Negi, who has the white pieces. Erenburg has black against Sabino Brunello. Among the 15 players with 5 points, we can find Jan Timman, Jonny Hector, Sune Berg Hansen and Romain Edouard. 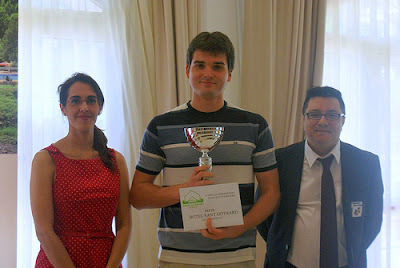 Ukrainian grandmaster Andrey Vovk is the new champion of the Andorra open. He finished in sole first place with 7.5 points. The event took place on 20-28th July at the Sant Gothard Hotel in Erts (La Massana). Vovk was the only player with 6.5 points that won his last round game, against the young Frenchman Eric Gaudineau. The game was a Ruy Lopez where white won a clear positional advantage. However, the Frenchman created complications on the kingside, which forced white to play accurately. The Ukrainian player did not falter and simplified the position to reach a rook endgame that he converted easily. Regarding the second place, seven players tied on 7 points. Players with 6.5 points, Eduardo Iturrizaga and Renier Vazquez, were the first to arrive at this score after drawing their game in just 10 moves, thus resigning chances to win the tournament. 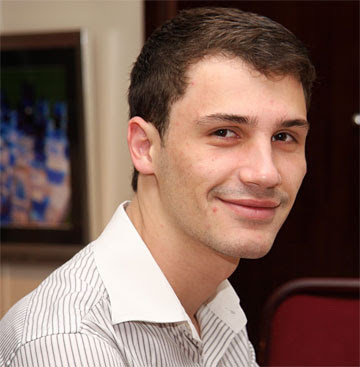 However, the game played on the third board between grandmasters Marc Narciso and Maxim Rodshtein was very disputed. The Catalan player was able to win a pawn in the middlegame, but the truth is that his rival achieved a more than reasonable counterplay and finally the position was simplified to a theoretical opposite-colored bishops endgame that was completely drawn. The prize for the best game went to International Master Lawrence Trent, thanks to his victory over Icelandic grandmaster Heddin Steingrimsson. 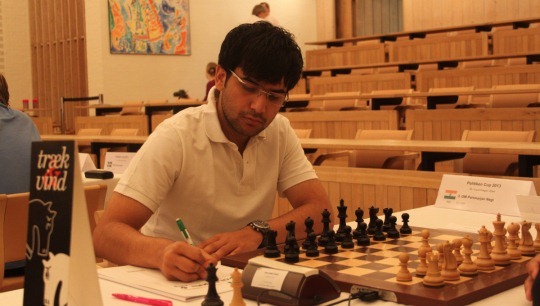 You are currently browsing the Chess blog archives for July, 2013.